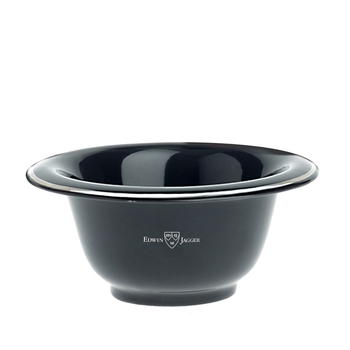 Elegant, classic-styled black porcelain bowl by Edwin Jagger. This handsome shaving bowl is finished with a silver rim and Edwin Jagger emblem. Its soft curves and smart design aid lather forming while keeping shaving soap in place. A stylish upgrade to any shaving set.